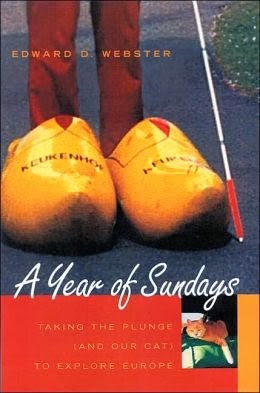 A Year of Sundays by Edward D. Webster is the story of a married couple in their fifties who decided to travel Europe for a year. They had previously traveled to Europe in their early twenties, but this time around, they found traveling to be very different. They don't have as much energy and Edward finds himself thinking this may be his last chance to see and experience certain things. They also take along their aging cat and adding to their challenges, Edward's wife Marguerite is blind. Edward and Marguerite spend time in a variety of cities throughout Europe in Spain, France, Germany, Italy, Greece and other countries. A few months into their journey, they find themselves in "English deprivation shock." They miss hearing and speaking English. Edward speaks some French, but often feels frustrated at not being able to find the right words and also must translate for Marguerite who doesn't speak French. They also miss hearing from their friends back home and become lonely and homesick. Simple things like doing laundry and grocery shopping were challenging in new places with different customs and languages. Nothing was simple or convenient and this wore on them. Although they were following their dream of spending a year in Europe, Edward finds himself surprisingly depressed and melancholy at times as he mourned his lost youth, impending old age, and mortality. I really wanted to like this book, but I felt as though I was sitting through someone's vacation pictures - all 3,014 of them. I just wasn't interested in excruciatingly detailed accounts of every hotel and rental they stayed in and how much they paid for it, their special travel clothes hangers getting ruined, their challenges in being able to find the right kind of cat litter and cat food, or any of the details of Marguerite's menopause. In fact, I honestly felt sympathy for Marguerite because of how often Edward mentioned her menopause and attributed so much to it. Having the opportunity to spend a year traveling in Europe is something few people get to experience. The chance to tell a great travel story was completely missed. Instead the author spent too many pages complaining about almost everything.